A one-sided narrative on migrants in the GCC criminalises an already voiceless majority. Migrant-Rights.org looks at the deep-seated mistrust of migrant workers, and the severe abuse they face at the hands of both officials and citizens. Saudi Arabia’s infamous campaign against millions of migrant workers, last year, fueled a xenophobic environment for these residents. The "security campaign" was not limited to Saudi, as other GCC states followed with measures to expunge their countries of "violators and infiltrators." The campaigns resulted in the arrests and deportations of hundreds of thousands from the region and further facilitated the practice of new aggressions against migrant workers. Last year, Saudi policemen and self-professed vigilantes searched door-to-door for undocumented Ethiopian migrant workers living in the Manfouha neighborhood, resulting in the death of one migrant. Authorities, as per usual, made no apologies and nor effort to investigate the murder – which was blamed on "clashes with rioters." That incident marks a worrying development in the reality of migrant workers in the region as authorities continue to incite violence against them using discourses of "illegality" and "infiltration." In this post, we examine the way GCC states criminalize the migrant population by encouraging citizens and security officials to police migrants. 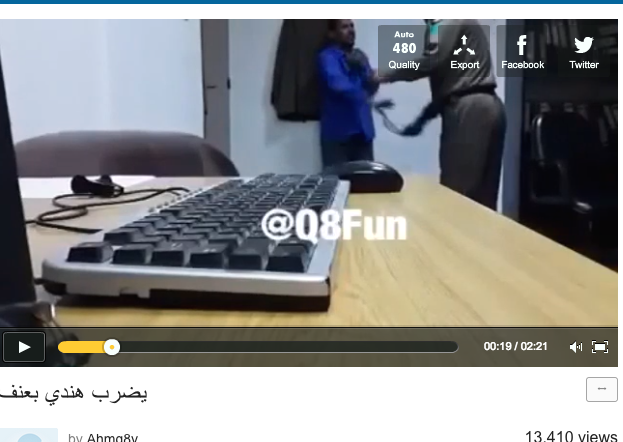 A screenshot of the video that went viral, showing an Asian worker being beaten up by a Saudi cop. Last month, Saudi newspapers and digital media outlets published the same photograph of a policeman in Tabuk posing proudly with Ministry of Interior Affairs officials. The photographs accompanied identical pieces praising his refusal to take a bribe from a "residency violator,” and lauding his receipt of a cash award for “heroically” taking the migrant to a detention center. Two years ago, the ministry also awarded policeman in Jeddah for refusing a bribe from a detained migrant worker requesting an expedition of his deportation. The government venerates security officers for refusing bribes, yet takes no action to fix the corruption and inefficiency that plagues the system. Local media reproduces this skewed narrative, merely ascribing the migrants as criminals and failing to account for the system’s chronic deficiencies, including indefinite detention and limited access to legal aid. The Saudi Ministry of Interior glorifies its security apparatus and criminalizes migrant workers to justify the mass raids and deportations that violate basic human rights. The story conveys the state narrative on migrant workers, one that also reverberates in the countless media photographs of policemen at check points and house raids: that migrants are security threats deserving of the disproportionate penalties levied on them, and that the work of police should not be monitored but celebrated. The celebratory story encapsulates the state’s failure to recognize its complicity in the vulnerabilities of migrant workers: firstly, that police corruption endangers migrants more than undocumented migrants endanger society, and secondly, that migrant's limited access to justice requires them to take these extra-legal measures. The Saudi Ministry of Interior glorifies its security apparatus and criminalizes migrant workers to justify the mass raids and deportations that violate basic human rights. Earlier this November, a viral video shared on social media showed a Saudi policeman whipping a South Asian male. The story did not appear in local press or even in other regional news outlets in the region (which commonly share negative stories of migrants in other countries). In September, 2014 the story of the Saudi religious police assaulting a “British” man, appeared in many local and international news outlets. Saudi authorities made no comments on the video at the time, and there remains no information available on the case. This physical abuse of migrants by both men in power and citizens has been long documented. The frequency of these aggressions is illustrated through the regularity with which these videos emerge; another followed shortly, showing a Saudi man hitting a migrant on the face with a shoe. Some citizens condemned these acts on social media, while others maintained that the migrants must have committed a crime, or that they deserved mistreatment because of their presumptive security threat. One dangerous tactic authorities used in last year’s crackdown was to threaten punishments of anyone employing or sheltering undocumented migrants; Mobile text messages from the Ministry of Interior warned of legal ramifications of hiring or sheltering "residency violators." Saudi Arabia announced a penalty of "two years in jail or SR 100,000" for those "cooperating" with undocumented workers. Similarly, the UAE announced a "two months in jail and Dh100,000" as a punishment in such cases. Qatar’s Ministry of Interior also warned against hiring of ‘illegal’ workers, announcing a fine of QR50,000 and/or a jail term of up to three years. Despite the frequent refusal of employers to renew workers’ visas that consequently forces migrants into an undocumented status, no local media reports account for any actual penalties levied against employers. While authorities somehow find the resources to penalize undocumented migrants and adopt strong rhetoric against individuals who hire undocumented migrants, GCC countries remain unwilling to proportionally penalize abusers of migrant workers and reform local policies that engender undocumented migration. Just last week, a Nepali migrant worker in Qatar was arrested and held for not having valid documents, even though it was the employer who had failed to renew his visa. Despite the frequent refusal of employers to renew workers’ visas that consequently forces migrants into an undocumented status, no local media reports account for any actual penalties levied against employers or any other citizens who hire undocumented workers. Instead, most media reports cite authorities severe penalization of migrants who help other migrants work; last August, a Kuwaiti newspaper reported the arrest of a "gang assisting runaway maids" for "committing fraudulent acts and assisting housemaids who run away from their sponsors or those who are sick and unable to work." Last year, Kuwait Times published a similar report about an "African gang,” publicizing the arrest photo of 15 men and 40 women accused of absconding from their employers. Last May, Ajman and Sharjah police forces arrested ten "absconding maids" and "gang" members for purportedly “luring” the women into escaping from their sponsors. These slanted narratives perpetuate misconceptions of migrant workers that render them more vulnerable to vigilantism in public spaces. The stories neglect to indicate the contexts in which migrant workers take such action; firstly, escaping one's sponsor is criminalized across all GCC countries, coercing female domestic workers to work with these "gangs." Under the Kafala system, domestic workers are not allowed to change employers without the approval of their current sponsor and have extremely limited access to justice, rendering it difficult to escape exploitative relationships. The criminalization of migrant workers seeking relief is embedded into the migration system of each of the GCC countries, while employers are rarely held accountable.